For the past three years, the U.S. Chamber of Commerce Foundation has been on a journey to help the private sector and communities realize the value and implement the principles of the circular economy in the United States. We’ve hosted tours and conferences, released research and case studies—but today, I’m excited to announce the next step in our circular economy journey: the city location for our Beyond 34: Recycling and Recovery for a New Economy project. Beyond 34 is a first-of-its-kind public-private sector partnership to help break through the current national recycling barrier of 34%. Our technical partner on the project, RRS—along with our network of corporate supporters—searched for a city with the right degree of readiness, innovation, and passion for this project. Project supporters including The Dow Chemical Company, Republic Services, Target, Walgreens Boots Alliance, and Walmart Foundation, provided valuable insights and resources throughout the first phase of the project. After months of searching, Orlando, Florida has been chosen to be the first region location for Beyond 34. The City of Orlando is working to be one of the most sustainable cities in America. Its strong private sector engagement, innovative culture, and robust sustainability goals were all factors that contributed to their selection. We’re excited to have the City of Orlando and the Orlando Regional Chamber of Commerce join us and RRS as partners on Beyond 34. Both the City of Orlando and the Orlando Chamber understand the massive opportunity of collaborating for a sustainable future. “Orlando is committed to reducing our environmental impact and as a result, we have a goal to become a zero-waste community by 2040. We’re making significant strides toward that commitment by providing our residents and businesses with the tools and strategies necessary to divert more waste from our landfills, including offering weekly recycling collection, quarterly e-waste drives, free backyard composters to residents, and a commercial food waste collection program that is diverting millions of pounds of organic waste per year.” – Orlando Mayor Buddy Dyer. “As the fastest growing region in the country, Orlando has a unique opportunity to show the world how large-scale sustainable growth can be achieved. Orlando is already paving the way in sustainability initiatives on a number of fronts including infrastructure, neighborhoods, recreation, transportation, and energy. Business and community leaders here are committed to planning for a sustainable future; we are excited to support the Beyond 34 project in order to equip these business leaders with the tools and resources they need to achieve their sustainability goals.” – Jim Thomas, Executive Director of Orlando Regional Chamber of Commerce. We know that the challenges we face today are too large for one sector to solve. Beyond 34 is unique because it will bring together private sector leaders with civic and local community leaders to drive collaborative solutions for the Orlando region and soon across the country. So what is next for the project? Over the next six months, the Beyond 34 partners will work together to build a strong foundation that will help Orlando become more sustainable. On October 19, Beyond 34 will host Orlando Region Waste Impact Workshop: How Public and Private Sectors Collaborate for Recycling System Optimization. This invite-only event will bring together business leaders, recycling planners, and key stakeholders in the City of Orlando and Orange County to collaborate around a sustainable system that positively impacts the local area’s recycling rate. The pilot project will also develop a blueprint for optimization, recycling materials mapping research, and a business plan for future innovation and growth. The long-term goal is to scale the project nationally—using research and case studies from the pilot to help other cities and municipalities implement circular economy best practices. 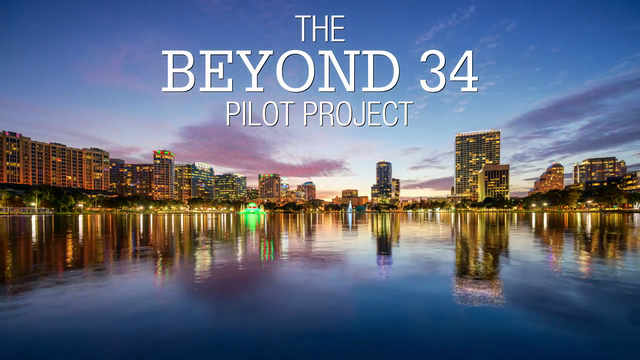 If you’re in the Orlando region or interested in getting involved in the project, I encourage you to visit www.beyond34.org to learn more. Earth Day Flash Sale Happening Now! Announcing New Speakers for #USCCFcircular! Final Days to Save on #USCCFcircular Summit Registration!